This album is a tour de force for jazz pianist Barney McClure accomplished over a span of several years when his whirwind life permitted. Accompanied by "bassist of choice" and friend Chuck Deardorf, this is a compilation of some of Barney's finest compositions along with choice selections from his favorite musical friends. Barney's comments on the title track really say it all: "My compositions reflect input from many sources. From saxophonist Denney Goodhew, I have tried to leap off the edge and soar magically and gracefully as he does naturally. Vocalist Jan Stentz shows me there are no limits to melodic logic and introspection. Sandy Bradley and the Small Wonder Big Band remind me that music can be pure and fun, and Marley's Ghost showed me how to create beauty with an open mind.Truly a gem of a recording that is at once simple and complex, provocative and imperturbable, inspired and inspiring. 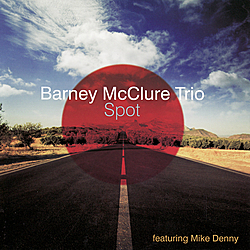 This album is a tour de force for jazz pianist Barney McClure. With occasional side trips into local and state politics, pianist/organist Barney McClure always maintained a powerful musical career performing with some of jazz's most distinguished artists. Probably better known as a pianist, McClure's Hammond B-3 work has been his secret weapon where he's been a favorite of guitarists like Herb Ellis, Howard Roberts, Joe Pass, Emily Remler and Cal Collins. Now, McClure teams with the dynamic, Oregon-based guitarist Mike Denny where they explore originals they developed over the last year of working together. Joined by drummer Kevin Congleton, the group takes a tasty B-3 trio musical journey. Recorded in 1983, this recording was originally released as "Hizzonor" while Barney McClure was maintaining a life as a jazz performer and as mayor of his hometown of Port Townsend, Washington. Dedication: To my wife/partner - Diane the most beautiful person I have ever known. To my daughters Theresa, Cheyenne, Rachel, Juliana, and son Sean - and thier families. My life and heart is full due to each of htem.